Today we marvel at arance as part two of the series dedicated to the little joys of being in Rome! One of my favorite things about oranges in Italy is that they also come in the blood variety. Don't be horrified. 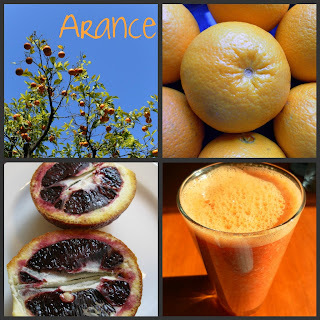 These blood oranges, also known as moro oranges, are delicious! Take a bite into one of these juicy fruits and you'll look like Edward with red juice streaming from your lips... Who am I kidding though? I have never seen Twilight so I'll stick to talking about fruit and the like in my own type of series. Thick, pulpy goodness! Spremuta is one of the most wonderful drinks. If you are in the "No pulp" camp, this drink might not be for you as it is essentially a smoothie made entirely of oranges. But it is great for a vitamin C kick. If you feel like spending 5+ Euro on this, there is a lovely caffe right on the Piazza di Santa Maria in Trastevere that specializes in spremute di arance. They are quite good and it is an ideal spot for people watching. However, I will just as happily through a oranges in a blender and call it a day. Il Giardino degli Aranci is a beautiful spot on the Aventine Hill in Rome where you can get a great view of St. Peter's dome from one angle and Palazzo Vittorio Emmanuele from the other. My favorite part about this garden, aside from the orange tree-lined walkways, is that from the entrance of the park, St. Peter's dome is directly in front of you and appears so massive as to think that you were only a short stroll away. However, taking that short stroll to the other side of the park, the dome seems to recede with every step. Once at the look-out, the dome seems no closer that any of Rome's other monuments. Neat trick. I am convinced, however, that there must be some conspiracy theory out there about this phenomenon, much like my ideas about the key hole through which you can see St. Peter's... interestingly enough located just next to the Giardino degli Aranci. Fend of Scurvy! Ascorbic acid (also known as Vitamin C) means no scurvy. So eating oranges can help you keep your teeth, stop your gums from bleeding and even halt your flesh from decaying... The poor 18th century blokes bound for long sea journeys weren't so fortunate. Pick an Orange off a tree, and it will never be rotten! Sounds like a saying doesn't it? Nope. It is just a fact that oranges are one of the few fruits that will not over-ripen if left on the tree.